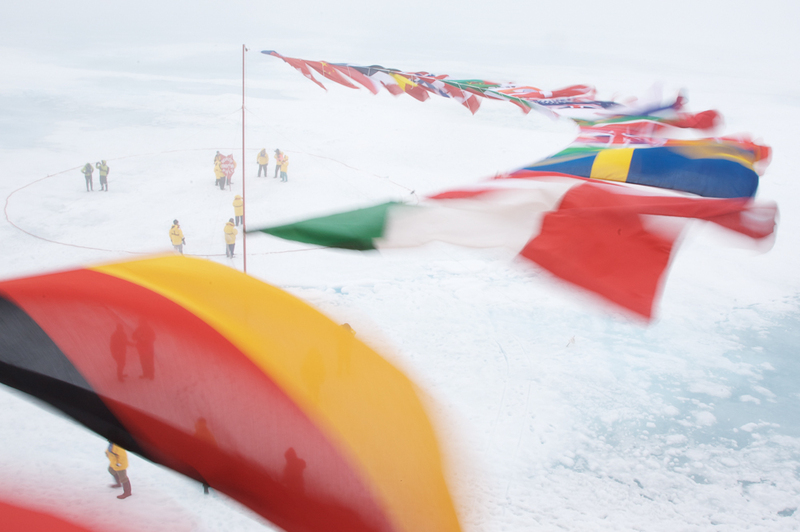 For more than a decade I’ve been writing about North Polar affairs, the history of the region’s exploration, its climate, ice cover and biodiversity. And although I’ve interviewed climatologists, photographers, conservationists and sea captains, the people associated with the Pole that I’ve enjoyed listening to most are those explorers who have travelled in the region on foot. These are the people who seem to instinctively understand the big picture, the people with ice in their blood. I’ve learned much about the Arctic from classic explorers such as the late great Wally Herbert, as well as from today’s most notable expedition leaders such as Pen Hadow. Over the years I’ve become fascinated by what draws human beings to this desolate frozen desert at the end of the earth. But never once did I imagine I’d get the chance to go there myself. 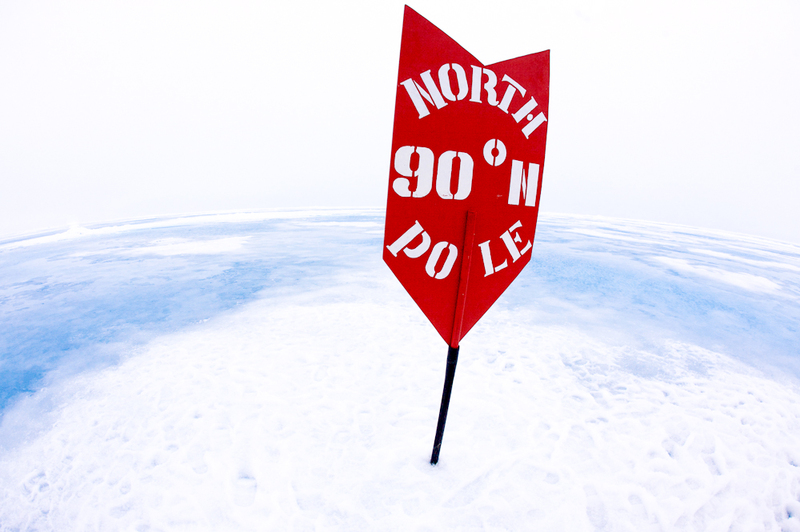 Prior to the 20th century no one had even seen the North Pole, much less set foot on it. We know that a little over a century ago – in 1909 – U.S. naval Commander Robert E Peary might have got there on foot with a team of dogs. He certainly believed he’d achieved his goal, but some commentators think he may have fallen short by as much as 100km. Richard Byrd may or may not have reached ninety degrees north in an aeroplane in 1926. In 1948, Russian Alexandr Kuznetsov set off under the instructions of Joseph Stalin to fly north for scientific and strategic purposes, and in so doing became the first person to undisputedly set foot on the Pole. In 1968 Ralph Plaisted reached it from Canada by combination of snow scooter and air. In 1969 Briton Wally Herbert broke new ground, and his arrival at the North Pole by dog-sledge was the crowning moment of one of the greatest ice journeys of the century. Since these landmark expeditions there have been many successful arrivals at the Pole by fixed-wing aircraft, helicopter and even parachute; by surface traverse, whether complete, one way or partial; by submarine (USS Skate was the first in 1959) or surface vessel. Of these, the first was the Soviet icebreaker Arktika, which reached the Pole on 17th August 1977. Since then there have been 65 Soviet or Russian voyages to the Pole, of which 64 have been in nuclear powered ships. Twelve other icebreakers from five other nations have made token expeditions to the top of the world, but the Russians are the experts. 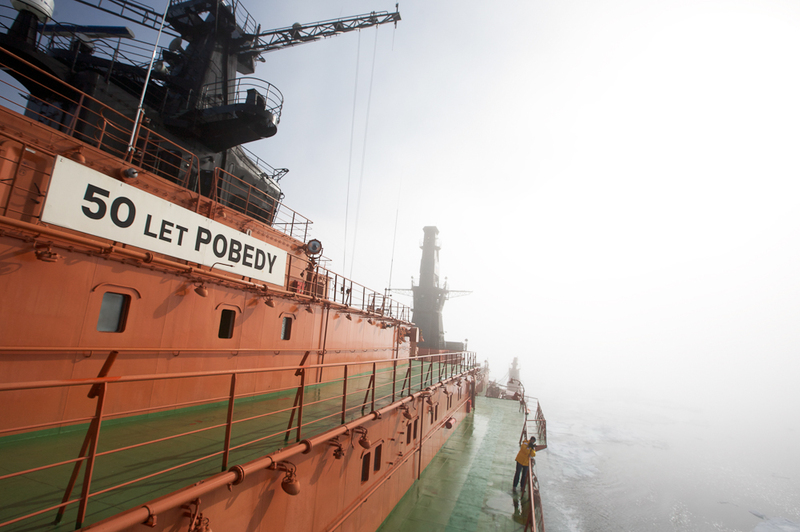 The reason for this, according to Captain Dmitry Lobusov of the Russian nuclear powered icebreaker 50 Years of Victory, is simply that there is a need. Of those countries with extensive Arctic Ocean shorelines, only Russia relies on the commercial transportation of goods through the sea ice. ‘We have very vast country from west to east and there is need to carry cargo by sea and so we need an ice fleet.’ Captain Lobusov explained how the development of nuclear technology has led to icebreakers of increasing power and range, with the ability to remain at sea for long periods without refueling. In the Arctic summer, when the atomic fleet is less in demand for keeping open commercial seaways, the 50 Years of Victory – or the ‘50 лет Победы’ – becomes available to adventure tourism companies such as Quark Expeditions, who commission the ship in order to make the armchair explorer’s dream of going to the North Pole a reality. I joined the Victory at Murmansk on the extreme northwest of Russia, on the Kola Bay. Way inside the Arctic Circle, the world’s northernmost city consists almost entirely of glum communist tenements hastily thrown up after the Second World War. After near annihilation by the Germans, who had an airbase only eight minutes away, Murmansk was designated one of only 12 ‘Hero cities’ in Russia. In 1943, Harper’s published an article about Murmansk by Dave Marlow called ‘How it Looked to a Merchant Seaman’, in which he quotes a Scots-Canadian mess-man: ‘they’ve took a beating here.’ The mosquitoes are like flying fortresses and the only dabs of colour are the buttercups and dandelions that seem to grow everywhere in Murmansk. We sailed for a week via Franz Josef Land, the northernmost Russian archipelago, and landed at Cape Tegetthof, where we saw the wind-blasted remains of explorers’ huts. 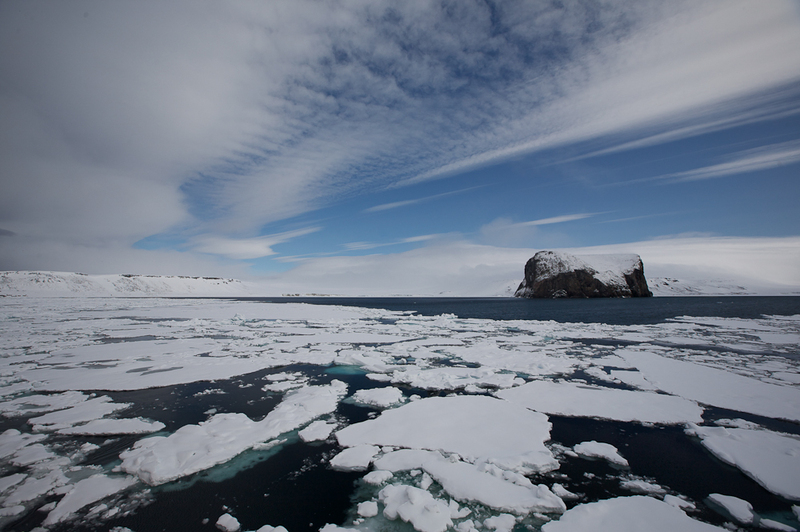 Then to Cape Fligley on Rudolf Island from which Kuznetsov departed on his successful flight to the Pole. 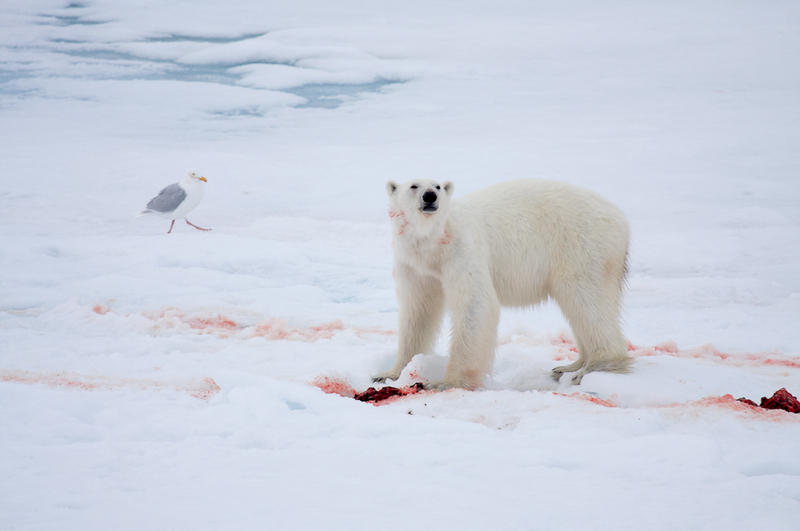 We saw polar bears, kittywakes, walruses, ivory gulls and memorials to dead explorers. As we reached the higher latitudes we navigated through the last of the open water before crunching our way through the pack that got denser and denser as we approached the Pole. Were there any ice conditions that the Victory couldn’t negotiate, I asked the captain through his interpreter Irena. ‘No’ was the reply. When I set foot on the ice at the North Pole I was the 22,500th person to do so, give or take a small margin for error created by the possibility of unrecorded military expeditions reaching ninety degrees North. The Pole is, of course, an imaginary place; a point on a grid of invented geometry, that in reality is no more or less impressive than a thin membrane of ice floating on the surface of the Arctic Ocean. The ice that is here today is not the ice that was here yesterday or will be here tomorrow. There is no marker other than one you may bring yourself, and the sapphire blue pools of water that lie on the surface of the multiyear ice here are just as beautiful here as they are at 89°N. T.S.Eliot wrote in his poem ‘Burnt Norton’ of what he called ‘the still point of the turning world’. At the earth’s ‘axle-tree’ he imagined the past and future to coalesce, a place where the spiritual and terrestrial worlds meet. And although it may be too fanciful to say that to stand at the Pole is to stand with one foot in another world, if you look directly upwards along the earth’s axis you will come to Polaris, the North Star, the so-called celestial pole. Look down and beneath your feet after a couple of metres of sea ice, there are 4,000 metres of sea. Then, after 14,000km of planet, you will reach sea level at the South Pole, after which there are then another few hundred metres of rock, followed by 2,835 metres of ice. If you have managed to maintain a straight line down through the globe you will end up almost in the middle of the geodesic dome of the Amundsen-Scott science research base at the South Pole. The significance of the intersection of all lines of longitude depends as much on who you are and how you got there as anything else. I arrived at 11:57pm 15th July 2009 sitting in the bridge bar of the world’s largest nuclear-powered icebreaker with a glass of ice-cold Russian vodka in my hand. Something like a hundred passengers from 24 countries had gathered below me in the bright midnight sun to wander around with their global positioning systems, anxious to be the first to claim that theirs read ‘90°N’ exactly. Of course, any such claims were irrelevant because the icebreaker was only at the Pole when the Captain said so, and his GPS on the bridge was the only one that mattered. As champagne corks popped we cheered and congratulated each other on our passive achievement, as if we’d arrived on skis after weeks of doing battle with pressure ridges, half-starved, frostbitten and with exhausted dogs. A ringed seal popped its head out of a channel of inky black water to see what the commotion was about, to find out what was breaking the rhythm of the creaking ice. There were no birds and despite the razzamatazz that goes with this extraordinary adventure tourism, it was possible to detect something of the deep primal spirituality that has lured the great explorers of the past to this pinprick of nothingness in the middle of nowhere. Accounts by explorers who arrive on foot after weeks of man-hauling sledges over pressure ridges vary wildly on how time at the Pole is spent. Some scrape together the last of their tobacco and alcohol for an all too brief party, while others become stranded while waiting for the twin otter to get in to pick them up. Tom Avery describes how in 2005 he arrived at the Pole with 4 other humans and 16 dogs only to see an immaculately dressed woman step off a helicopter with a bottle of champagne. She was leading a small group of tourists who had flown to the Pole (presumably from an icebreaker) on a ‘once-in-a-lifetime’ ultimate tourist experience, as marketed by top end adventure travel companies. The jury will probably remain out forever on whether tourists should be allowed to travel to ecologically sensitive destinations such as the higher latitudes of the Polar Regions. But the prevailing sentiment on the 50 Years of Victory was that, provided the operator transacted its business responsibly, that the environment came first and that we didn’t cause any unnecessary stress to the wildlife, then not only did we have a right to enter this pristine world, but we would come home as ambassadors, to write articles and tell our friends exactly what it is we’re supposed to be protecting. Doug Allan is a freelance wildlife and documentary photographer and cameraman working underwater, on land and especially on the polar ice. Born in Scotland, he graduated with a degree in marine biology from Stirling University in 1973. This was to propel him into a career in field science that gradually transformed into one of wildlife photography. Today he is one of the leading wildlife photographers of his generation with a feast of credits including the BBC’s ‘Blue Planet’ and ‘Planet Earth’. Doug was working as a diver on an Antarctic research station when he met David Attenborough in 1981 while the BBC was filming polar sequences for ‘The Living Planet’. For Doug that was the ‘decisive moment’, as it dawned on him that the cameramen he was watching weren’t doing anything physically that he couldn’t. With his specialist knowledge and prodigious abilities as a diver, all he had to do was ‘work on my photographic skills’. And so a career-long relationship with the legendary presenter was launched. Much of Doug’s wildlife photography involves physically overcoming the environmental harshness of some of the world’s wildest places and then waiting for his subject’s behaviour to reveal itself. ‘I do like working in really wild situations’ he says. The advent of digital has improved his life no end – he can spend more time underwater without having to surface to reload film. As for processing, he remembers Kodachrome film taking a year to get from Antarctica to a UK lab and back. Doug has won the underwater category in Wildlife Photographer of the Year twice as well as the Royal Geographical Society’s Cherry Kearton Photography Medal. He has also won Emmy and BAFTA awards for his moving images. Nick Smith: When did you realise you were going to become a wildlife photographer? Doug Allan: When I first went to the Antarctic in 1976 I was thrown into an overwintering environment with only about 15 other people on base. Most were photographers and some had a very good eye. With the penguin colonies and the seals on my doorstep a serious interest was kindled. DA: A Petriflex given to me by Dad in 1971. It was a very simple SLR. I don’t think I had a wide- angle lens, just a standard 50mm. For underwater photography it was the old faithful Nikonos II – it was the most advanced then, but no electronics at all. DA: I didn’t have any. I feel almost more in need of formal training now with digital than I did back in the days when we used to do our own processing. Now there is so much you can do in post processing, and you have to be careful if you want your digital files to be around in 30 years time. DA: I’m a specialist in wildlife and wild places with an even narrower niche of cold weather environments both underwater and topside. I don’t shoot weddings. Well, I shot a wedding once as a favour and it was the most traumatic thing I’ve ever done in my life. DA: It’s hard to pick one or two. What I’m interested in is ‘difficult-to-get-behaviour’ from genuinely wild animals. That’s where I get the buzz – being in the wild and seeing things happening for real. What turns me on is being in the company of big mammals. You can’t hide from a polar bear – he hears and sees as well as you do, and yet his sense of smell is better than a bloodhound. In those situations your body language, behaviour and even what you’re thinking are ultra important. It’s like you have to talk to your subject in a non verbal way. DA: It can be frustrating if you’ve put a lot a lot of effort into a shoot and you feel it’s not been given the best chance on screen because the editing or production is sloppy or misses the point. But, mostly I’ve had the chance to work with high class production teams. DA: Digital encourages experimentation and as a stills photographer the field is absolutely wide open to interpret whatever you see in whatever way you can imagine. Shooting with film teaches you the basics very well, with each press of the shutter having an associated cost. There was no alternative when I started. Digital frees you up creatively and the sky’s the limit. NS: What’s the most important thing you’ve learned from another photographer? DA: I just went the classic route – the base I was on in the Antarctic subscribed to National Geographic. We’d look at the pictures and admire them. I’ve always preferred the wide-angle from up close rather than the telephoto. I liked Ernst Haas with his long exposures to experiment with blurring movement. We used to try that on base and quickly realised it was much harder than it looked. Also the early Jacques Cousteau and Hans Hass books influenced me a lot – the idea of exploring the undersea world with a camera. DA: I realised after 10 years in Antarctica that photographing and filming animals encapsulated so much of what I enjoyed doing. Travel, adventure, being part of a team, doing something you think is worthwhile – all those things come together in what I do. NS: What makes a great wildlife photograph? DA: You have to take yourself to exciting landscapes or put yourself in front of inspiring animals. Unless you’re really interested in your subject you’re not going to catch that special magic.